Award-winning British filmmaker Ken Loach has donated all proceeds from screenings of his latest film in Israeli venues to the Palestinian BDS National Committee (BNC) as a gesture of support for the Palestinian struggle for freedom, justice and equality. Loach’s film “I, Daniel Blake” was screened in Israel against his wishes. We at the BNC are very moved by his gesture of solidarity and are heartened, as always, by his long-standing, principled and unwavering support for the Palestinian nonviolent struggle against Israeli military occupation, settler-colonialism and apartheid. Inspired by the cultural boycott of apartheid South Africa, the BDS movement appeals to conscientious artists to refrain from performing in Israel and to refuse participation in events sponsored by the Israeli government or entities complicit in Israel’s egregious human rights violations, until Israel meets its obligations under international law. The BDS movement does not expect artists who heed the Palestinian call for cultural boycott to do anything beyond their control to isolate Israel’s regime of oppression. Ken Loach’s films bear witness to grave injustices and brim with integrity, love and human solidarity. They look at the brutality of power head on, and never lose hope in the capacity of decent people acting together to transform the world, to make it kinder and more beautiful. 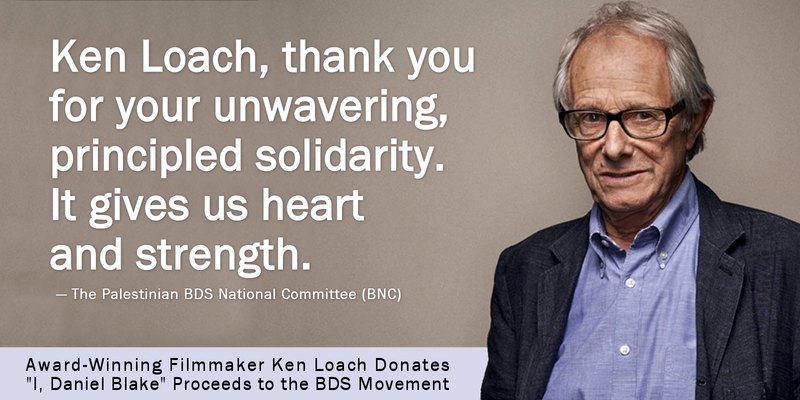 Ken Loach embodies all the integrity and generosity of his films. Thank you, Ken, for your unwavering and principled solidarity. The Palestinian BDS National Committee (BNC) is the largest coalition in Palestinian civil society. It leads and supports the global Boycott, Divestment and Sanctions movement. Follow us on Facebook and Twitter @BDSmovement.